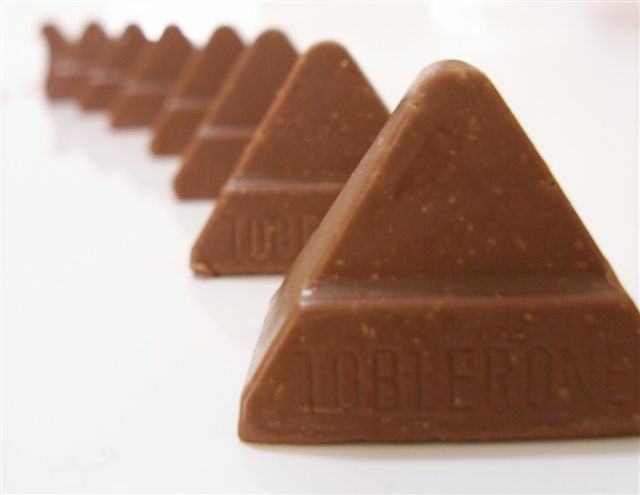 I like how you play with perspective here by presenting the triangular shaped chocolate in a straight line that our eye has to follow till we reach the end in the background. This helps to keep a viewer's attention. Now I do have some critiques on the composition for there are some elements that could improve. First, the white background comes off as too stark and sterile to bring out the rich tones and colors of the chocolate. It color of the chocolate looks a little too washed out. Black (or a dark hue) maybe the better choice to bring out richer colors in the chocolate to entice our eyes to want to take a bite as well. Even the introduction of a background that has visible texture that is complementary to the imagery you want to convey could be a nice addition- i.e. a velvet cloth conjures the ideas of "soft" and "smooth" in the viewers. Those ideas helps establish a connection with the main image -the chocolate. The viewer then makes the connection of "tasting" the chocolate as smooth and soft. color seems just a bit off. The chocolate doesn't look dark enough but its been a while since I examined a Toblerone. Composition looks good. Clever idea, wish there was a bit more focus and DoF. I like this. In my own personal opinion it would have been even better if the entirety of the front candy had been visible, but still a very attractive and interesting composition of an original subject. Yummy, great placement and use of shapes. is that first one really in focus? Even the first one does not seem in focus. This is original! Well done! Proudly hosted by Sargasso Networks. Current Server Time: 04/24/2019 03:52:25 AM EDT.